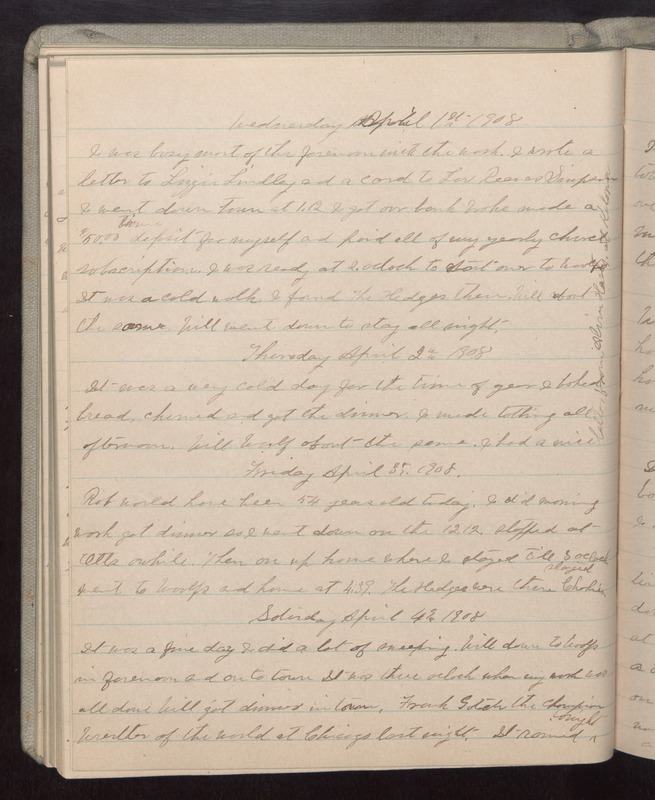 Wednesday April 1st 1908 I was busy most of the forenoon with the wash. I wrote a letter to Lizzie Lindley and a card to Lou Reeves Simpson I went down town at 1.12. I got our bank books made a $50.00 [illegible] deposit for myself and paid all of my yearly church subscription. I was ready at 2 oclock to start over to Woolfs It was a cold walk. I found the Hedges there. Will about the same. Will went down to stay all night. Thursday April 2 1908 It was a very cold day for the time of year I baked bread, churned and got the dinner. I made tatting all afternoon. Will Woolf about the same. I had a nice letter from [Alvin Hardy?] at [Koloner?] Friday April 3 1908 Rob would have been 54 years old today. I did morning work got dinner so I went down on the 12.12. Stopped at Otts awhile. Then on up home where I stayed till 3 oclock. Went to Woolfs and home at 4.39. The Hedges were there Charlie stayed Saturday April 4 1908 It was a fine day I did a lot of sweeping. Will down to Woolfs in forenoon and on to town It was three oclock when my work was all done Will got dinner in town. Frank Gotch the Champion Wrestler of the World at Chicago last night. It rained tonight.